The California Department of Pesticide Regulation (DPR) is currently reviewing uses of fipronil and imidacloprid (common ingredients in spot-on topical treatments) due to possible human health risks. According to some scientific studies 6 7, oral flea and tick medications appear to be a safer and more effective alternative to topical treatments and collars, possibly because they are easier to use as directed. Some oral flea control products also help control ticks and other parasites, such as hookworms, roundworms, and/or heartworms. Vets are a trusted source for flea and tick control information, and with your help, we can educate Bay Area pet owners about the efficacy of oral medications and the toxicity of pesticides in spot-on treatments. 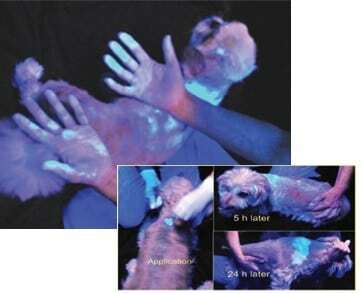 The photos above are part of a study where researchers incorporated a fluorescent dye into the spot treatment to photograph the spread. Photographs are reprinted from Bigelow Dyk, M., et al. (2012). Fate and distribution of fipronil on companion animals and in their indoor residences following spot-on flea treatments, Journal of Environmental Science and Health, Part B: Pesticides, Food Contaminants, and Agricultural Wastes, 47(10): 913-924. Reprinted by permission Taylor & Francis LLC. • Contrary to manufacturer labels, spot-on products do wash off during bathing. A study by California Department of Pesticide Regulation (DPR)8 measured the residue of fipronil spot-on products in baths for treated dogs. Fipronil was detected in all samples up to 28 days after application. Further, results from another DPR study indicate that concentrations of pet treatment pesticides are far greater in wastewater from a pet-grooming site versus concentrations measured throughout a sewer collection system. For more information, please review this DPR presentation9 or review this peer-reviewed article: Teerlink, J., J Hernandez, R Budd. 2017. Fipronil washoff to municipal wastewater from dogs treated with spot-on products. Sci Total Environ 599-600: 960-966. • Flea Treatment Products Are Found In Wastewater Effluent, Sometimes At Concentrations Above Toxicity Thresholds For Aquatic Species. Because wastewater treatment plants are not designed to remove pesticides, some flea and tick products pass through treatment plants and are discharged into San Francisco Bay. 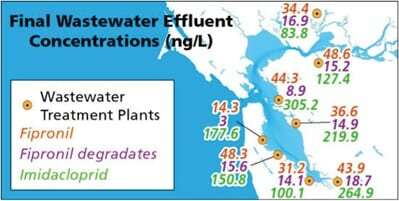 Based on data from wastewater treatment plant effluent (discharged water), pesticide concentrations going into the Bay can exceed toxicity thresholds for aquatic invertebrates, and therefore, may compromise water quality and impact compliance with the Clean Water Act. A study of fipronil and imidacloprid at eight Bay Area municipal sewer systems was recently conducted by the San Francisco Bay Regional Monitoring Program.10 The study monitored imidacloprid and fipronil, as well as fipronil degradates, in the influent and effluent of eight urban California treatment facilities. Fipronil, its degradates, and imidacloprid were present in the influent sewage and final treated effluent of all eight systems. How do these indoor pet flea control uses compare to other uses of these pesticides (such as outdoors and underground for termite control)? In most of California (except for downtown San Francisco), outdoor urban runoff flows through separate storm drain systems that discharge directly to creeks without any treatment. Consequently, runoff flows can wash residues from outdoor fipronil and imidacloprid applications directly into surface waters. Monitoring data for both fipronil and imidacloprid in urban runoff and creeks has been compiled and analyzed by DPR.11,12,13 Northern California urban runoff fipronil concentrations are similar to fipronil concentrations in treated municipal wastewater effluent.10,11 California urban runoff imidacloprid concentrations are generally lower than imidacloprid concentrations treated California municipal wastewater effluent.10,12,13 Unlike runoff, which occurs only when it rains, sewage discharges occur continuously. Due to this continuous discharge, indoor pet flea control uses have potential to be a more ecologically significant source of these pesticides than urban runoff. 1 Litchfield et al., “Safety Evaluation of Permethrin and Indoxacarb in Dogs Topically Exposed to Activyl® Tick Plus,”J Veterinar Sci Technology 2015, 6:2 http://dx.doi.org/10.4172/2157-7579.1000218. 2 Bigelow Dyk, M., et al. (2012) Fate and distribution of fipronil on companion animals and in their indoor residences following spot-on flea treatments, Journal of Environmental Science and Health, Part B: Pesticides, Food Contaminants, and Agricultural Wastes, 47(10): 913-924. 3 Keenan, James J., John H. Ross, Vincent Sell, Helen M. Vega, Robert I. Krieger, “Deposition and spatial distribution of insecticides following fogger, perimeter sprays, spot sprays, and crack-and-crevice applications for treatment and control of indoor pests,” Regulatory Toxicology and Pharmacology 58 (2010) 189–195. 4 Ross, J., T. Thongsinthusak, H.R. Fong, S. Margetich, R. Krieger, California Department of Food and Agriculture, “Measuring Potential Dermal Transfer of Surface Pesticide Residue Generated from Indoor Fogger Use: An Interim Report,” Chemosphere, Vol.20, Nos.3/4, pp 349-360, 1990. 5 “Assessing Intermittent Pesticide Exposure From Flea Control Collars Containing the Organophosphorus Insecticide Tetrachlorvinphos,” Davis, M., et al., J. of Exposure Science and Environ. Epidemiology, 2008, Vol. 18, pp 564-570. 6 “Flea blood feeding patterns in cats treated with oral nitenpyram and the topical insecticides imidacloprid, fipronil and selamectin,” McCoy, c., et al., Veterinary Parasitology, Vol. 156, pp 293-301, 2008. 8Teerlink, J., J Hernandez, R Budd. 2017. Fipronil washoff to municipal wastewater from dogs treated with spot-on products. Sci Total Environ 599-600: 960-966. 10 Sadaria, A.M., Sutton, R., Moran, K.D., Teerlink, J., Brown, J.V., Halden, R.U., 2017. Passage of fiproles and imidacloprid from urban pest control uses through wastewater treatment plants in northern California, USA. Environ. Toxicol. Chem. 36:6 1473-1482. 12 Ensminger M., Budd R., Burant A., Wang D., Singhasemanon, N. 2018. “Imidacloprid Monitoring in Urban Surface Waters of California, USA,” Presentation at the SETAC North America 39th Annual Meeting, Sacramento CA. Available online at this link.